5 D 1 5th fretfr. 4 Ab 2 6th fretfr. 3 D 4 7th fretfr. 2 F 3 6th fretfr. 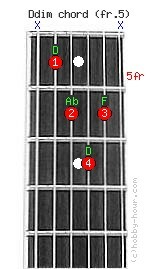 Chord Ddim (5th fret) notes: D, Ab, D and F. You must leave out the 6th and 1st strings. Ddim - D diminished triad guitar chord's alternative names: D°, D-5, Dm-5, and Ddim. See also: Ddim7 and Dm7b5.